Interests:Autocrossing, atv riding, general tinkering, machining, a few other things. This is something I've only encountered during autocrossing; as my car got faster I soon ran into problems with the power steering not keeping up with my demands. For instance, driving the car through a slalom I would find occasions where the car would loose the power steering when I was trying to turn the wheel as fast as possible. The faster the engine spun, the worse it got. This is because of Mitsubishi's method of giving the Starion speed sensitive steering. The Starion employs a flow-sensitive valve inside the pump that reduces power steering pressure as flow increases, giving the effect of stiffer steering for high speed operation. Unfortunately, when you're spinning 6000 rpm in a slalom, it has the nasty effect of making your steering feel like it is locking up and properly screws up your times. 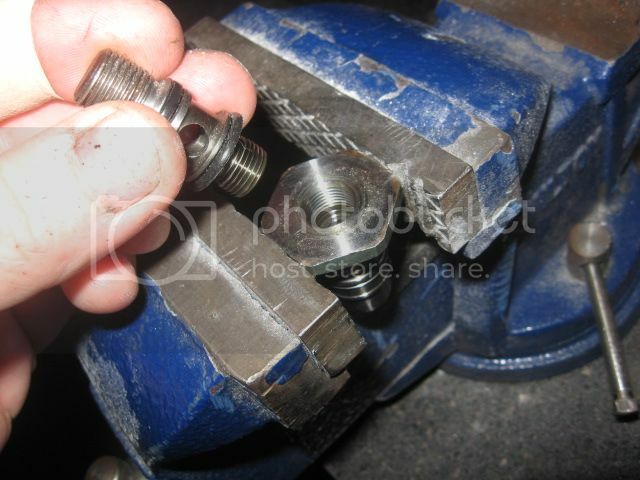 Following that guide, I took the valve assembly out of the pump (it's the plug that your high pressure hose attaches to) and pressed it apart using a punch and socket as detailed in the dsmtuners post. I my case I shimmed the valve using a spacer I machined from aluminum (edit: but washers can be used as detailed in the DSMtuners post. I believe whatever is used must have a hole in the center for oil to flow through, but I can't recall for sure). If memory serves I shot for the middle of the road at 3mm. The end result... no perceptible change at all with the exception that I had power steering whenever I wanted it! Driving on the street or highway had no change in steering effort or feel, but on the autocross course I've never encountered a power steering problem since. Based on my experience, I'm actually reasonably sure that Mitsubishi's variable steering method is more for track racing where you can top out the engine at higher than freeway speeds. I haven't taken my car to a road course since the modification, but I'm reasonably sure that the steering will still be just as controllable as it was before the modification. That said, I don't recommend doing this modification unless you've encountered the problem. It wasn't until I installed coil overs on my car that the chassis could react fast enough to require faster steering inputs. Edited by Maxzillian, 30 October 2013 - 10:03 AM. What's the fun in making something simple? '87 TSI - StarOrion braided brake lines, StarOrion radiator, StarOrion alternator, StarOrion 2.5" stainless exhaust w/Magnaflow muffler, 1G MAS, Competition Clutch 15 lb flywheel, Competition Clutch Stage 4 clutch, Mookeh polyurethane bushings, ABS elimination, 8:1 Wiseco Pistons, TD05 14G turbocharger, Axiss ceramic rear brake pages, Hawk HP+ front pads, heat wrapped and ported exhaust manifold/turbine housing, Accusump oil accumulator, remote oil filter, NJV head, EVO intercooler, remote battery, D2 coil over struts, flatty front struts and control arms, 8" non-SHP wheels all four corners, 12.75"x1.25" front rotors with 4 pot Wilwood calipers, manual brakes using dual master cylinders and balance bar, gutted (deleted) brake proportioning valve and modified steering pump speed sensitive valve. after reading the link i see you can use washers as a shim. Edited by importwarrior, 30 October 2013 - 05:58 AM. Good catch, I edited what I posted to point that out. Yep, when I used to race I encountered the same thing. It was essentialy a dead spot in the steering, funny cause I would get it mainly in the slalums as well. I will have another car someday so this will go in the bank for future use... great find! Thanks. I have had this happen myself. Just didnt know what the cause was. Awesome. I have tried to fix this with synthetic fluid with okay results. This is better. I only autocrossed twice I think, but I remember keeping it in a lower gear and just revving the crap out of it and the steering was very heavy. Good mod! The spacers mentioned in this section only need to be added if you want to modify the pump to eliminate the high-RPM cut out that these cars have. DO THIS AT YOUR OWN RISK! Otherwise, you can skip to the last step and just replace the four o-rings. Speed sensitive steering is a feature available on many different cars. Its job is to give the car a more stable and heavy feel at highway speeds, and to make the car less prone to sudden changes in steering angle at speeds where such a move would be dangerous. It also allows more steering assist at low speeds for parking maneuvers. Speed sensitive steering is great, but that's not what our 2L (Turbo & NA) DSMs are equipped with. We have RPM sensitive steering, which acts somewhat the same. It will decrease the steering boost at highway speeds because the engine is turning 3500-4000 RPM, but unfortunately it severely cuts the steering boost in the upper-rev range, regardless of what gear the car is in. 6000 RPM through an auto-x slalom results in minimal steering assist, followed by a sudden lack of any assist. Not exactly what an auto-x driver is looking for. The steering assist reduction is caused by a valve in the power steering pump itself. We will be adding a spacer to preload the spring inside the small assist varying valve that closes at high RPM. This will stop it from restricting the flow of PS fluid out of the pump at high RPMs, but will not raise the maximum pressure of the fliud leaving the pump. Some people have in the past shimmed the flow bypass valve in the pump. This is a separate assembly that sits below the assist varying valve. This resulted in more steering assist at high speeds, but accomplished this in a bad way. The flow bypass valve is there to relieve the high pressure created when the pump spins faster (high RPMs) and the flow exceeds that which is needed by the power steering system. 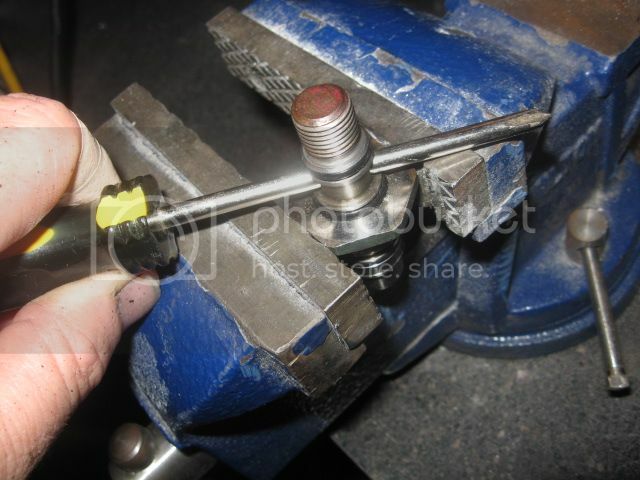 If you shim this valve the fluid has nowhere else to go, and its pressure will increase far beyond the factory levels. I tried this, but after a 15 minute drive at moderate speed my fluid boiled and I lost steering assist. Not good. So, we are going to preload the spring inside the flow control valve connector. 1. Remove the top part of the connector from the bottom part. I put the connector in a vise and used a phillips screwdriver through the fluid port. The top part unscrews CCW like a normal bolt, but it may be tight. 2. Place the lower part of the connector in a large deep socket (or something similar; the taller the better) supported on its outside diameter, and make sure the small dark colored cap at the very bottom is not hitting anything. Put a long thin phillips screwdriver through the threaded hole in the top until it hits the bottom cap - make sure it goes all the way down and is centered. Tap the screwdriver handle gently with a hammer until the cap pops out. (You may have to tap a little harder, but take your time so as not to knock the cap into your bench). 3. 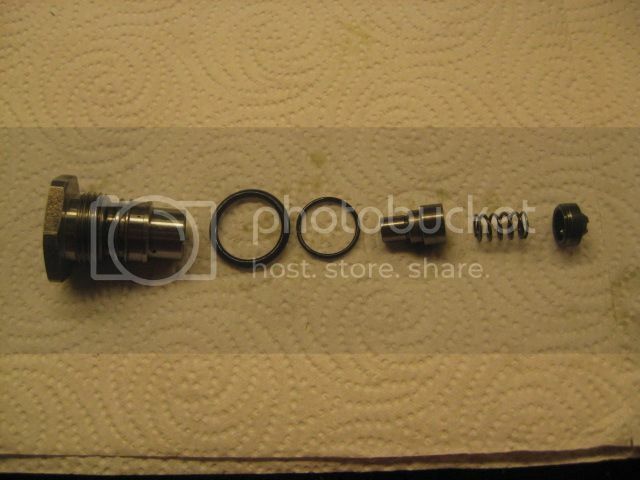 Once the cap is off, you can remove the spring and plunger. We will be putting our spacer(s) in the base of the plunger, under the spring. This will preload the spring, making it more difficult to compress as the high-RPM pressure increases. 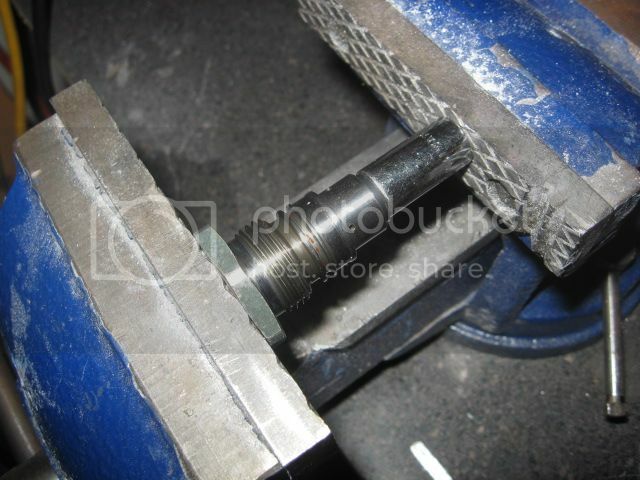 For mine, I used two small lock washers that I flattened and then spread open slightly to fit the bore a little better. My total thickness ended up being 2.4mm, compared to the 3.5mm mentioned in the VFAQ. I'll post back with results once they are available. 4. 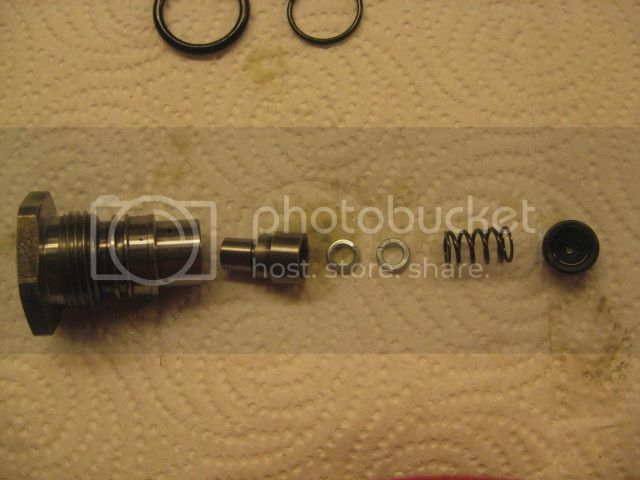 After cleaning and inspecting the parts, put the plunger back into the lower connector, put the spacers into the plunger, and then insert the spring. Be sure that the spring is sitting flush and can be compressed evenly. 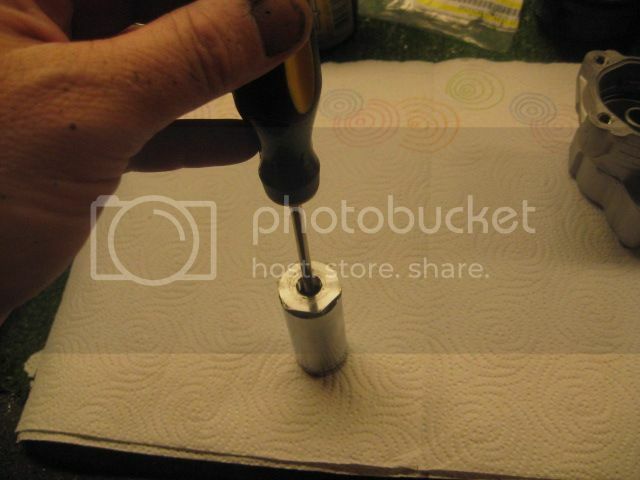 Find a small socket that will slip over the "nozzle" on the cap, and use a vise to press the cap back into the connector. The cap should bottom out just slightly past the point of being flush with the bottom of the housing. 5. Replace the o-rings on both the upper connector half and the lower part, and screw them back together. Be sure to use some fluid on the o-rings as a lubricant. From top to bottom (outside the pump to inside), the flow control valve o-ring sizes are 11mm x 1.9mm, 13mm x 1.9mm, 17.8mm x 2.4mm, and 13.5mm x 1.5mm.